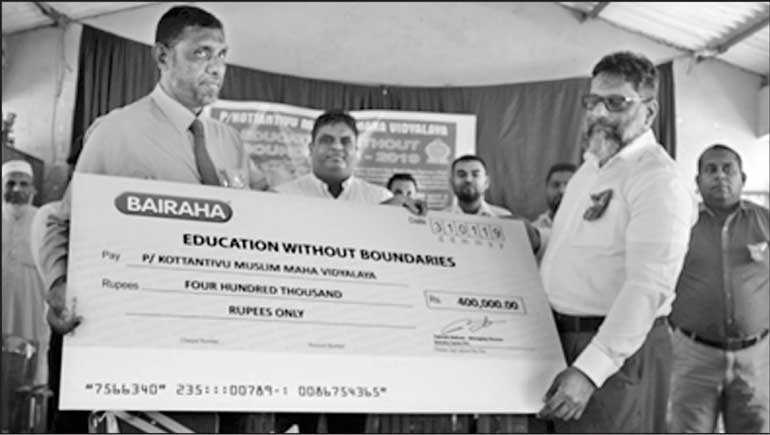 Bairaha Farms PLC, the pioneer poultry integrator in the island recently launched their second grand educational CSR project for the year 2019, titled ‘Education without Boundaries’ in the Konthathive Maha Vidyalaya in the Puttalam District, in their continuous effort to uplift the educational standard of the children in the country. The company had identified this school in their project survey to be an underprivileged school in the Puttalam District deserving financial assistance in order to purchase their furniture requirement. The management also observed that this school has been in existence for more than 70 years in the area and currently has 450 students and 20 teachers. But due to current poor in the school, all students have to undergo severe difficulties in continuing their studies. In a grand ceremony held in the main hall of this school on 31 January, with the active participation of the Company’s Director (Operations) M.I. Wahid, other Senior Managers and the Zonal Director of Education and other officers, a cheque for a sum of Rs. 400,000 was donated to the Principal of this school for the purchase of the school’s furniture requirement. The Principal, Haffez, having accepted the cheque expressed his sincere gratitude to the Board of Directors of the Bairaha Farms PLC, for the valuable financial assistance facilities at the school. The Zonal Director of education addressing the gathering thanked the management of Bairaha for the implementation of this CSR project in this deserving school and assured their cooperation for further development of the school.